There are three government entities that perform different roles regarding termite control: the United States Environmental Protection Agency (EPA), the U.S. Department of Agriculture and the State and local government agencies. A rigorous pesticide review to ensure that registered termiticides used according to direction labels and precautions are taken to ensure effective termite treatment with minimal risk. Being one of the principal sources of information about pesticides and non-pesticide controls. The Environmental Protection Agency encourage termite prevention efforts. The research of different termite control treatments and technologies and support related to termite eradication efforts. Publishing news and events for the public on termites and termite control. Funding Louisiana State University termite programs on termites and Formosan Subterranean Termites. The U.S Department of Agriculture, also has a Pest Management Division (PMD) that is the State agency responsible of licenses. It licenses commercial pest control businesses in Arizona and the pesticide applicators and inspectors employed by these companies. Also, they enforce federal and state laws governing pesticide use and storage. Consumer complaints involving licensed businesses are handled through the Agency. They are guided by the Environmental Protection Agency (EPA) regulations and state statutes and rules. There are a number of licenses offered by the OPM. Licensing requires an application, examination, and, in the case of Qualifying Party licensing, experience. Businesses must maintain statutorily mandated levels of insurance or bonding in order to be licensed. All the OPM-issued licenses must be renewed annually. Within the state and local agencies involved in termite control is the U.S Department of Housing and Urban Development. It requires reports, inspections, and treatment. Based on maps published in the IRC (International Residential Code), CABO One and Two Family Dwelling Code, and/or the US Department of Agriculture’s Bulletin 64, the four HUD Homeownership Centers (HOCs) have identified areas of the country where potential damage by termites is considered extremely high, called Termite Infestation Probability Zones. Arizona is included on this list. There is also a list for termite treatment exception areas too. The places mentioned on this list are: Alaska, Colorado, Idaho, Maine, Michigan, Minnesota, Montana, New Hampshire, New York, North Dakota, Oregon, South Dakota, Utah, Vermont, Washington, and Wyoming. The Centers for Disease Control and Prevention (CDC) plays an important role in pest management and termite extermination efforts. The CDC serves as the national focus for developing and applying disease prevention and control, environmental health, and health promotion and health education activities designed to improve the health of the people of the United States. How does the CDC influence termite control and treatment in Arizona? They fight disease vectors and pests by using integrated pest management (IPM) techniques that are necessary to reduce the number of pests that threaten human health and property. This approach to the problem relies on more than one technique to reduce or eliminate pests and can be visualized as concentric rings of protection that reduce the need for the riskiest and dangerous options of control and the potential for pests to evolve and develop. It involves monitoring, identifying, and determining the level of threat from pests, making the environment hostile to pests, building structures designed to keep the pests out, eliminating the things which attract pests to the property and using traps, physical elimination devices and selecting appropriate poisons for identified pests like termites. The CDC says that subterranean termites are the most destructive and costly insects, affecting large numbers of wood structures in the United States. Annually, this is more property damage than that caused by fire and windstorms combined. Termites consume wood and other cellulose products, such as paper, cardboard, and fiberboard, and can also destroy structural timbers, pallets, crates, furniture, and other wood products. Eliminate wood contact with the ground. Do not allow moisture to accumulate near the home’s foundation. Reduce humidity in crawl spaces. Never store firewood, lumber, or other wood debris against the foundation or inside the crawl space. Use decorative wood chips and mulch sparingly. Have the structure treated by a professional pest control treatment. Ready for a Scottsdale termite inspection? Varsity Termite and Pest Control offers free termites inspections across the Phoenix Valley. 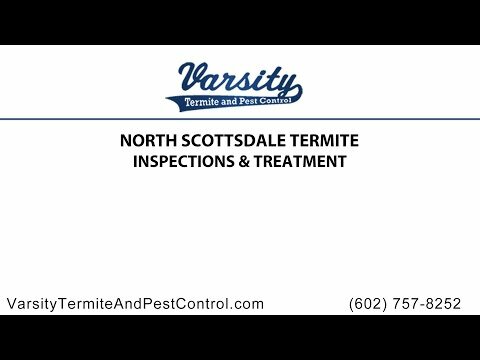 Call us to learn more about termite control and treatments in Scottsdale Arizona. CAN TERMITES AFFECT YOUR HEALTH? Read the rest of CAN TERMITES AFFECT YOUR HEALTH? Read the rest of Are All Pesticides Created The Same?